The University Health Center and JMU Counseling Center shone a spotlight on National Recovery Month on Monday, September 18 with a hands-on self-care workshop. The University Health Center and JMU Counseling Center put on this event and several others to educate students on ways they can help themselves during times of great stress. The event was well attended and enjoyed by students who now know more about self-care and which strategies work for them. “The reason this matters to me is that I believe this can have a really negative interaction in someone’s life,” Koon said during her presentation. 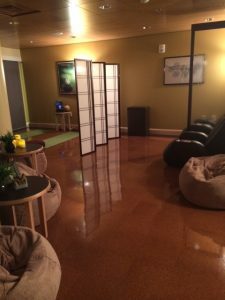 This is the oasis, a relaxation room found in the Counseling Center. Before inviting everyone to move to the seven self-care stations, Koon and the other presenters encouraged students to take advantage of resources like the Counseling Center’s studio and oasis, the arboretum, Madison Meditates, UREC classes, and volunteering with animals in the community as part of their self-care routines. The different stations held by student workers and volunteers included animal-assisted therapy, deep breathing by blowing bubbles, kneading playdough, coloring, making buttons, aromatherapy, and relaxing yoga sponsored by UREC. Students talked avidly about self-care with the volunteers and excitedly made buttons, colored, and lined up to pet the therapy dog. There was also a separate resource table available, but most students were comfortable discussing the different strategies as they approached each station. Students often mentioned how they have heard of one of these methods but had never tried it. Like Adelstein, many other students seemed to agree that the aromatherapy station was one of the best. At this station, students smelled different bottles of scents commonly used in the Counseling Center’s diffusers. As they enjoyed each scent, they also were able to learn about the research-proven effects of each one and about aromatherapy in general. “I’d rather people use stuff like this than go to medication,” Alexis Carrasquillo, one of the table’s volunteers, senior psychology major, and intern for the Counseling Center, said. She explained that although aromatherapy doesn’t work for everyone, it’s a more “holistic and natural” way to relieve stress. Self-care has a huge impact on her life, and she even wears a necklace with a cotton pad in it dabbed with one of her favorite scents for on-the-go aromatherapy.